This view of the West Front of the First Principal Court of Hampton Court Palace shows the magnificent Tudor architecture. 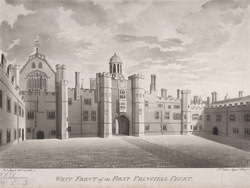 The Palace, as its name suggests, was built around a series of courtyards. For three centuries Hampton Court was a favourite Royal residence but the palace had ceased to be used by George III and his family in the later eighteenth century. The oldest part of the palace is the bell hanging in the small tower above Anne Boleyn’s gateway which can be seen in this picture. It was salvaged from a chapel which previously stood on the site of the palace. The community chapel was part of a working farm which was owned by the military order the Knights Hospitallers of St John of Jerusalem.